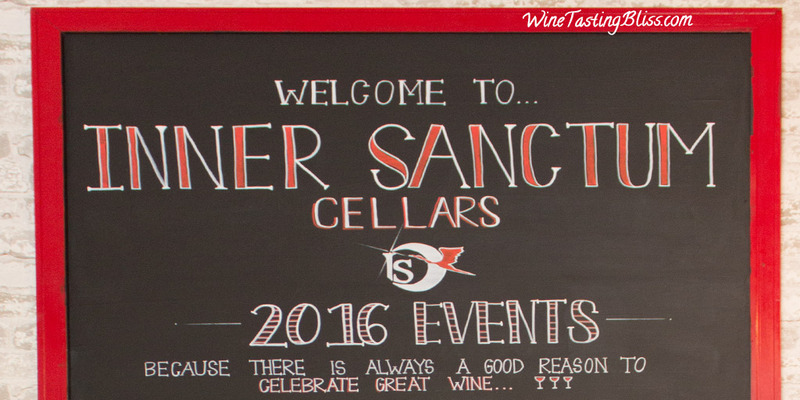 The newest winery in Jamestown, California, is Inner Sanctum Cellars. Don’t be fooled by the size of the tasting room, this young winery makes a big statement with both the quality and the quantity of its wine list. We recently had a chance to revisit Inner Sanctum, and there was a lot to like! This was not our first visit to Inner Sanctum. Our first visit was fun, with some wines showing unique elements induced by the Rim Fire. 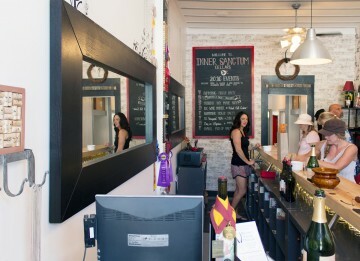 We met Karen, one of the owners, and loved her passion for wine and enthusiasm for their business. Nearly a year later, we were thrilled to have a chance to taste their newest vintages. This tasting was presented by wine guide Erin, who very ably ran the busy tasting room single handedly. She set us up with wine glasses and got us started with their 2014 Verdejo “Mateo the Matador” . Crisp, refreshing, with great citrus notes and a hint of slate on the finish, this fit our 95 degree day perfectly. Next was their 2014 Albariño “Quixote”, which showed pear on the nose and mango on the tongue with anise on the finish. A real flavor party! We then tasted their 2015 Chardonnay “Dwell in Joy”. Spending five months on American oak, this chard gave us a very fun burst of sour apple in the middle of the taste. We then jumped to red wines with their 2013 Cinsaut, “First Kiss”. The aroma made us swoon, and the fruit (especially cherries) made us want to come back for more. Their 2014 Tempranillo “Torro” gave us wonderfully balanced fruit, with a surprise element of grapefruit. 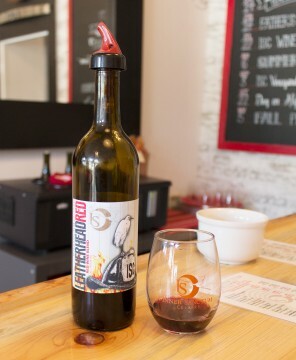 The highlight of the tasting was their non-vintage Leatherhead Red, a blend of 70% Merlot, 15% Zinfandel and 15% Petite Sirah. Lot of fruit, especially cherry and blueberry, with soft tannins and a surprising zip of pepper on the finish. This immediately made everyone’s “take home” list, our first truly unanimous decision of the day. Our tasting finished up with their 2013 Cabernet Sauvignon “The Beginning”. This was a cab-lover’s cab, with balanced fruit and good complexity. This will be an award winner in a few years. It was time to find a restaurant! 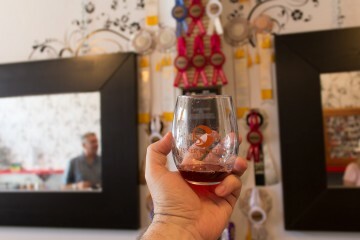 We purchased our wine, thanked Erin for a wonderful tasting, and set off into the summer heat. 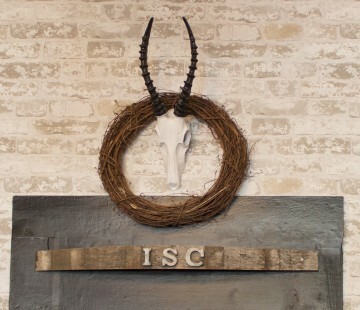 Have you visited Inner Sanctum? Click to give'em a tweet of support! Next Post:Are You in the Wine Club?